Portsmouth's Premier Guitar & Stringed Instrument Repair, Servicing, & Custom Building Specialist. Visitors by appointment only please ! LUTHIER Simon Jones at SGL GUITARS is Portsmouth's premier dedicated professional guitar and stringed musical instrument custom build, repair and service specialist with over 17,000 instruments serviced and repaired over the past 28 years. At SGL Guitars, you are GUARANTEED a vast improvment on your guitar, bass or other instrument. Go on... treat your guitar! Scroll down to see customer testimonials. Spend a little time exploring this easy to navigate website, there's plenty of information here but if you don't find what you are looking for, make sure you call on 07912 655517 or e-mail me on simon@sglguitars.co.uk, I will always be glad to help you any way I can. The gallery pages show some examples of the more interesting repair and custom building work that I have completed. I will add more pics as work is completed and when guitars I have made come in for servicing. Just click on the thumbnail image of your choice to be taken to the full size picture. If you want to go straight into prices for repairs and servicing, the Workshop Prices page gives a detailed description of exactly what is included in the most popular guitar repairs that I undertake and will help you to evaluate the level of service you receive for your money in comparison with other luthiers... just check it out and see exactly what a professional set-up includes for example. TO TWEAK OR NOT TO TWEAK? The Technical Page is definitely worth a look if you want to get a bit more... er... technical. "I am a professional freelance electric and acoustic bass player and also a studio owner and record producer. My touring and recording experience is extensive ranging from Cerys Mathews UkTours, Shakin Stevens Europe, Gary Numan, several world tours, the West End and back via TV Radio and any musical situation a bass guitarist finds himself in? I have known Simon for many years now and he has worked extensively on my working instruments ranging from Wal basses, Fender, Epiphone, upright electric and acoustic double basses and various retro and custom made one-offs. He has also prepared many instruments for me to be studio-fit, ie set up and in tune, which many newcomers to recording so often overlook?? Simon has always managed to fit me in at short notice and never complains about the odd mix of instruments I throw his way. It is absolutely crucial for a busy professional to have every instrument in tip top condition and full trust in the luthier. My 1st choice is SGL! If I was to have one small criticism it is that he is a Goldwing rider and being a BMW GS rider myself we do tend to clash occasionally??????" Simon, I felt I had to write and tell you how thrilled I am with my repaired FYLDE acoustic. As you know it was badly damaged and I didnt think such an old and rare guitar could be repaired. You are a fine and skilled craftsman and I thank you. "I have known Simon for many years and he has always been a genius with any guitar I have given him. He does such a good job, I've never had to have them set up again! If you want a reliable Luthier who is also a good guy... call Simon at SGL Guitars"
"I've known Simon for some time now and have no problem recommending his sterling work to any of my clients. As you can imagine, in the studio, intonation and reliable electronics are under the microscope and those things will waste a lot of time, so a good set up and electronics check are essential. When Girlschool came to record an album, they had borrowed an old Les Paul Custom. On opening the case the headstock was hanging off! "Don't worry girls" I said I know just the man! Simon repaired it before the drums and bass were done, and we spent most of the afternoon looking for the repair that Simon had done - it was that good!" Tim Hammil, "Sonic One Studios"
"Having used Simon for Many repairs and guitar builds over the last 21 years, I have always found him enthusiastic, committed and above all professional in his understanding of the job in hand. I'd fully recommend his work!!" "I have known Simon for several years now and he has saved my Bouzouki many a time before crucial gigs here and abroad. His re-fretting, setting up and general make over is top quality, making my Bouzouki more natural sounding and easier to play, Top Man!! Cheers Simon." Chris Pitson, "Boys From The Hill"
"My experience with Simon has also been excellent. He has worked on 2 electric guitars for me and 1 for my father. He's done an excellent job on all of them. Simon is friendly and very informative on the work he has done. I no longer live in Swansea, but I am about to get in touch with Simon to get my bass set up when I go back next." 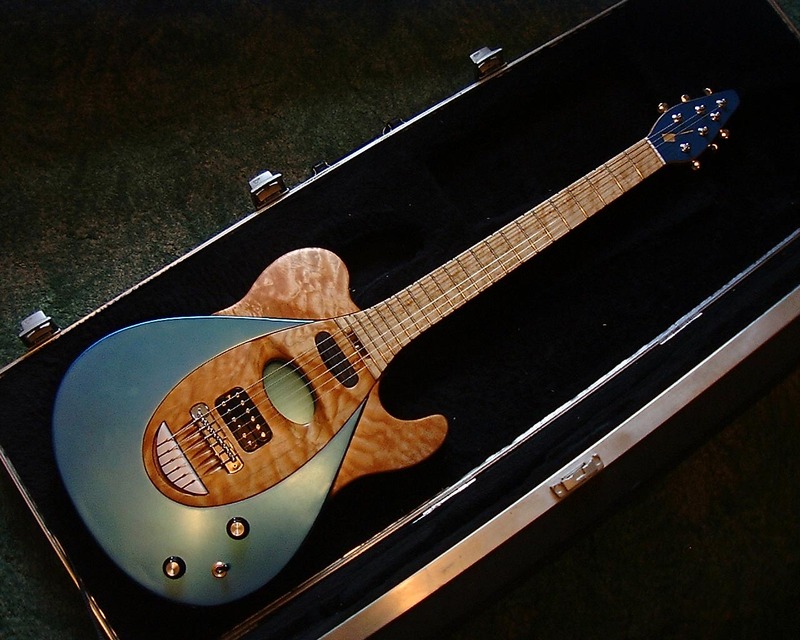 "Simon Jones is an absolutly excellent luthier, he is a wizard sorting out guitars. i have had 2 serviced, and set-up by him, and the difference is stunning. I strongly recommend him, you won`t find anyone better." "Simon has worked on four of my guitars, my friends bass and my lead guitarist's guitar too. All different jobs, but the same outcome - fantastic service form a highly skilled guitar tech!" "Simon is a very good guitar tech - he's worked on several of my guitars, with jobs including refrets, setups, pickup installs, tuner replacement and putting together a Warmoth project for me. He's also worked on several friends' instruments, including an immaculate refret of a 70s Les Paul. I've recommended him before, and have no hesitation in doing so again." So why does my new guitar need a set-up? The reason for wide range of prices on some jobs is due to the varying amounts of wear/un-eveness on the frets. ...when you bring your guitar in for a "Class A" set-up or a "re-fret" at SGL Guitars, you are not just getting fantastic quality work, you are also securing yourself THREE MONTHS of FREE after sales service and adjustments to take account of changes in playing environments, string choices and variations in climate. All you need to do is give us a call and pop around for a re-adjustment. So you need not worry about digging deep into your pocket every time you visit SGL Guitars.. How's that for peace of mind?! Did you know that here at SGL Guitars, after years of working with woods, learning to understand the way the fibres react to heat and clamping techniques and developing a feel for the way the wood "talks" back to you whilst under treatment, Simon Jones is able to offer heat treatment of guitar and other instrument necks and bodies to permanently remove warps and twists which are not meant to be there! So before giving up on that bent neck, give Simon a call to see what he can do for you. Go to the Custom Gallery or click on the image to see the latest full set of images of this custom guitar. My professional set-ups are renowned for their quality and value for money. Just check out the Workshop Prices page for full details and prices. If booked by phone a day or two beforehand, most set-ups can be turned around by the next, or sometimes even the same day. Pics of my conversion to a Burns version of the RED Special which brings it even closer to the original design...CLICK HERE TO SEE!!! Please note however that the information of this conversion is provided for interest only. Due to the considerable cost of this conversion, no further orders are being taken. Sorry!